Where will my bike take me? Where will I take my bike? These two questions reveal a basic split between different cycling mindsets. Is your bike a toy that you mount on the roof of your car, the better to drive it to your recreation area of choice and play until you must return home? Or is it a true alternative transport, a means for you to explore your neighbourhood and get fit without knowing it, all the while commuting, running errands and generally getting about? In short, is it a gadget or a useful machine? These questions open up a greater can of proverbial worms: road bike or mountain? Maybe it's just me, but there don't seem to be a lot of bikes on the market these days that can work both ways. It's actually easier to own a whole stable of expensive single-purpose bikes than it is to put together a multipurpose steed which you can hammer through the city streets, navigate down couple of trails and then U-lock to a lamppost overnight without losing sleep. How did our bike culture arrive at such a place? When I put together my new fix, I was looking for an all-rounder, a companion for all my different riding adventures. I already knew enough not to bother looking in the shops. But, when a venerable steel Centurion turned up on eBay, I guessed that it might be what I was looking for. Big tyres are the key to off-road and potholed city comfort, after all, and traditional lugged frames tend to have loads of room in the dropouts. As soon as the frame was delivered, I knew that it was the answer to my prayers. It had been built for 27" wheels, so it took my 700x32c setup with room to spare. Now that I had the option of big tyres, nothing would keep me off the gravel paths and fire roads on my commute home. My bike could be both a toy and a useful means of transport. Even mud and snow would offer no hindrance--after all, I had fender mounts and I planned a fixed drivetrain. In true fixed gear DIY tradition, I sourced parts from all over, including an assortment from my own parts bin. You can see the full spec below. I think the total out of pocket cost was just below $200. So far, this bike has been as useful as it is fun. 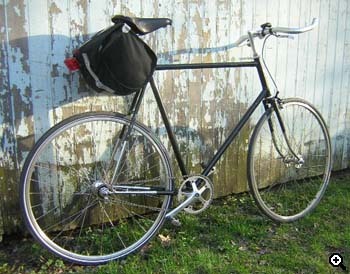 My other experiences with fixed gear have been that of nimble track-style bike with short wheelbases. If I had to make a comparison to other fixed bikes of the courier ilk, I would have to say that this is my Cadillac to their Ferraris. Don't get me wrong. The handling isn't sluggish. In fact, the bike corners as well as any of your favourite steel club racers of the past. The longish wheel base and wide tires make a ride through the city more comfortable without noticeable loss of speed. In fact, the confidence this bike instills makes it feel like I can actually go faster on urban roads. When you know that the bike you're riding isn't delicate, you just go for it. 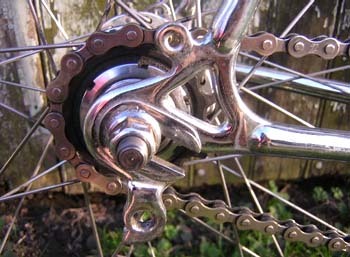 And because the gearing is currently 46x18, you have to. Otherwise you'll find yourself ambling along at 40rpm. In a laboratory, a purebred road bike may prove to be faster, what with less rolling resistance, lighter weight and all. But few of us ride bikes in laboratories or on perfectly smooth pavement. The real world is full of obstacles. Wider tires and a flexible frame help take away some of the stress those obstacles create. As for life's other obstacles... well, riding helps you deal with those too. Another thing older frames have to their advantage (particularly for the off-road fixer) is their sizing. We all know that up to about the early 90's a person's bike frame was taller than it would be today, often resulting in bars that are set very low. Low bars are great for track racing or time trials. But for getting to work in traffic every day, or for getting a good view of the forest from your local fire road, they are less than ideal. A larger sized frame means that you don't have to raise the bars than much to get them where they should be for those activities, about level with the saddle. You can actually use the drops without killing your neck. You can relax your elbows. You can absorb shock from some of the rough off-road stuff with your flexed arms. Life is good again, because you are riding a bike that fits comfortably without having to resort to a crazy extreme angled stem with a foot of extender underneath it. The best accessory by far has turned out to be the Carradice. It is sturdy enough to carry a full load without a rack, which makes it super convenient for lugging, even on fast club rides. I keep it on all the time and often forget it's there. I'm not sure why I didn't get one before. The only thing missing now is a nickname. But if I keep pedaling, I'm sure it will come to me.